Words that John Belushi lived by. 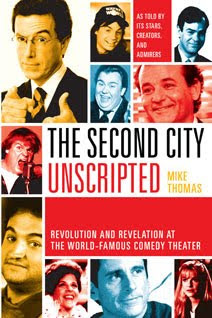 I just finished reading Mike Thomas' Second City Unscripted - a good oral history that does for the the comedy troupe in Toronto and Chicago what Tom Shales' Live From New York did for SNL. My favorite story in the book is from SNL and Second-City alumnus Tim Kazurinsky, who recalls being dragged to John Belushi's Chicago Blues Bar at Belushi's insistence, where he gets a PR advice from the guy who played Bluto in Animal House. "Basically it was, like, four pinball machines, a pool table, and a bar...a big bunch of nothin'. People would kill to get in. They would pay a fortune to try to get smuggled in there." "I said, "Who are all these people?" "And (Belushi) said - and this was his little lesson to me - "All right, the Blues Brothers are gonna jam with the Eagles. Here's the Eagles. Those guys there are our PR people. Those guys there are their PR people. These are our assistants; these are their assistants. These guys are all reporters from Rolling Stone and Time...."
"Everybody had a corporate tag, a reason to be there. The place was jammed. And he said, "You are gonna read about this wonderful event in Rolling Stone, Time, and Newsweek, and what a great party it was, and how the crowd really enjoyed it. But you know something? You're the only person who's not a journalist or an assistant or an aide or a PR person." "It was his way of saying, "This is the way the business works. This a completely planned and controlled event." The Second City Unscripted is available on Amazon.ca and a digital download.